Mom's Gone Bronson! : Step into Spring with Therafit Shoe! GIVEAWAY! Ends 4/30/16. Step into Spring with Therafit Shoe! GIVEAWAY! Ends 4/30/16. Disclaimer: I was provided with a pair of Therafit shoes in order to give my honest opinions. I was not otherwise compensated for this post. All opinions are my own, and your views may differ. Thank you! Therafit have new shoes out for you to enjoy, this spring and I got a first hand look at some of them just this past week! 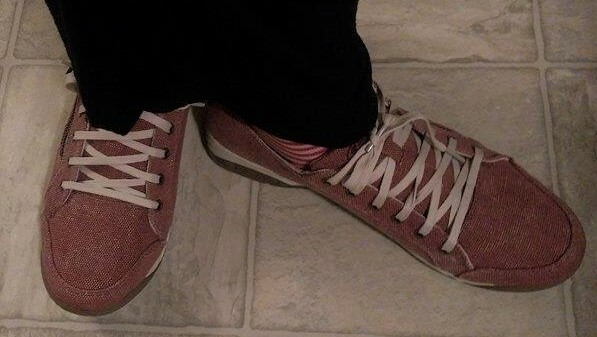 I got to try out the Sienna shoe in Rose color and I do like them a lot, even though they seem a little slimmer and more snug of a fit compared to the other Therafit shoes I have tried, and adored over the last few years! If you wear half sizes, you will be sure to want to size up for these shoes and if you are a wider foot then you can adjust the laces and the side zip for better comfort, but a much better fit on a slender foot! The color and design on these is unique and very fashion friendly! 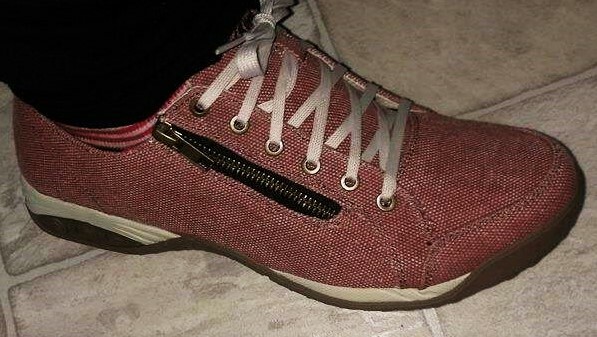 I can wear them with just about anything, and they give a boring pair of jeans a pop of pizzazz at the bottom! As usual, you can adjust the shoes to make them feel comfortable to suit your own preferences with the Therafit PCS (Personal Comfort system), which helps to support your feet alongside the removable cushioned insoles, too! The Sienna shoes are available in 10 different patterns and sizes and make a perfect addition to a spring wardrobe - you can most definitely wear these to make a statement with a skirt or a dress and you can utilize them for active events and sporting ventures as well! Therafit don't just stop with one new line of shoes this spring, they also have the Flora, Candy, Grace and more, which you will find over at their website, where you can also claim a 10% discount with coupon code SHOP16 at checkout! Therafit wants to let you try out a pair of these fabulous shoes, too, this spring and so we are giving a pair away, in the size of your choice, and all you have to do is enter the rafflecopter form, below! The winner will be chosen at random within 24 hours of competition end and will be notified accordingly with 48 hours to claim their prize. If the prize is not claimed within that time frame then a new winner will be chosen until we have a new confirmed winner, in the same way. Entrants must reside in the U.S.A and must be over 18 years of age or have parents permission to enter. Prize is fulfilled by Therafit Shoes, not Mom's Gone Bronson or any other participating blogger. The Tiffany sandals are awesome, love the color and style. I really love the Suzie Women's Patent Leather Adjustable Sandal in white. What a perfect summer sandal! I really like the Austin Women's Denim Clog Slip On, so nice. I love the Euro Women's Ankle Boot. I would love the Grace Womens leather adjustable sandals. I would love the Sandy Sandals! I live near the Beach and need a comfortable arch support sandal because I like to do a lot of walking and they come in 3 beautiful colors! Thank You for this fabulous giveaway! The Ginger Womens Printed Mesh Athletic shoes would be perfect for the gym! I really love their Maya in emerald! They just look like a really comfortable everyday shoe in a great color! I like the London leather casual shoe and I like a lot of the sandals and the leopard athletic shoes. I like the Rio ballet flats! I love the Flora sandals and would love a pair! I have a pair of the Coco Ballet Flats and love them, they are so comfy! So many great styles -- I really like the Gigi, Brittany and Candy. So many great shoes at Therafit! If I had to pick one favorite, I'd go with the Austin Women's Clog Slip Ons. Have you heard about Spring Step shoes? Available in men's and women's styles, these shoes have been brought to the United States from Portugal so that Americans can experience the style and comfort Europeans already know! You might simply have come to a conclusion that broader feet must inevitably be adorned with unfashionable alternatives. However, Wide Fitting shoes have long since ceased to be a hard to find commodity or a range of footwear crafted in out dated styles and hidden away in some corner of your shoe stores.